Republican Senator Jim Inhofe’s appointment as Chair of the Senate Armed Services Committee bodes well for the future of space. Senate Majority Leader Mitch McConnell recently appointed Senator Inhofe chairman following his stint as acting chairman of the committee while John McCain fought cancer in 2018.Previously, Senator Inhofe was a ranking member of the Armed Services Committee from 2013 to 2015. Inhofe had a long and successful career in business before becoming a full-time politician. He worked for 30 years in the field of aviation, as a real estate developer, and in insurance, eventually becoming the president of the Quaker Life Insurance Company. It stands to reason that the equipment, training and resources will extend to space. 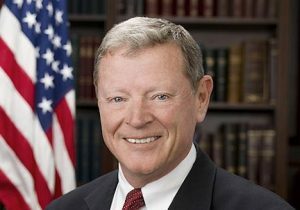 Senator Inhofe has been relatively active on space issues from his seat on both the Senate Armed Services Committee and Senate Committee on Commerce, Science and Technology. Most recently, Inhofe noted he is warming up to the Space Force proposal after initially expressing skepticism of the concept. He has also noted he is concerned about the cost associated with establishing a Space Force. Inhofe said that the Pentagon is winning him over to the idea and that hearings on the proposal would likely precede the Senate’s work on the fiscal 2020 defense authorization bill. As a fellow Oklahoman, Inhofe was an early supporter of Rep. Jim Bridenstine’s nomination to lead NASA. Administrator Bridenstine has been a vocal advocate for aligning civil and national security space investments, and with him as Administrator and Senator Inhofe as the new Chair of SASC, we hope to see some policy initiatives on such collaboration. With his history of support for the armed forces and his past success in the commercial world, Senator Inhofe may be open to more collaboration with commercial space operators. Challenges in space will only increase in number and sophistication, and the private sector has introduced new technologies. We hope Senator Inhofe and the committee will seize the opportunity to support new space initiatives.